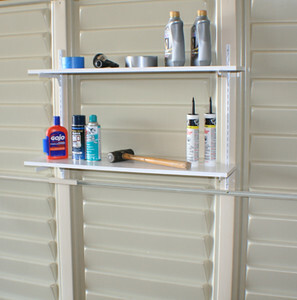 The DuraMax 12 x 36 Double Shelf Kit will quickly install into most DuraMax Sheds, allowing for more organized storage of tools and yard products. This shelf kit boasts durable vinyl and metal construction and is 36 Inches x 12 inches x .75 Inches. Installation instructions are included in this kit. Will this shelf fit the DuraMax SidePro 10.60x 3ft shed? This will not fit the side of that structure.